Escape to a tropical paradise and join Surf Camp Adventure for the best yoga and SUP retreat on Maui, immerse yourself for 8 days of indulgence at this beautiful sanctuary, and re-connect with yourself. This retreat offers daily yoga, meditation, and pranayama classes. 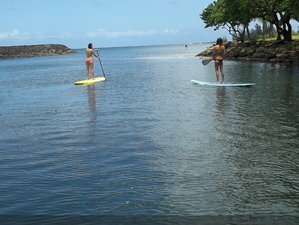 You will also enjoy stand up paddle boarding on the best beach on Maui. Have the best vacation in Hawaii! The accommodation for this retreat consists of 24 rooms and suites all with island or ocean views. Each room is exclusively equipped with a private bath, air conditioning and spectacular views. Surf Camp Adventure offers you a king or queen-bed double room or twin room. No matter what type of accommodation you choose for this retreat, Surf Camp Adventure guarantees that each room has its own charm and they will offer you the comfort you deserve during your stay. Your six-acre private retreat overlooks the north shore of Maui which is famous for its surf spots. This location has beautiful ocean views and it is surrounded by lush tropical gardens which also supply your farm to table meals during your stay. This retreat will serve you daily delicious organic breakfast. At the end of the day, you can pamper yourself with a traditional Lomi Lomi massage or Surf Camp Adventure’s wellness programs. Started as a small surf school in San Diego, California, in a small surfing community called Mission Beach, Surf Camp Adventure caters various vacation trips such as surf camps and yoga retreat camps.